It’s just one of the wonderful moments of being a purple martin landlord. When I refer to “Me and my Martins” I often forget about the hitchhikers they tend to get. Lucky for me, I don’t get too grossed out. The last nest check I noticed that the purple martin nestlings in gourd #3 had some bird lice and the next day every nest got a 1/4 teaspoon of Sevin 5% dust. I will try and do a complete nest change of that gourd (#3) that I saw the louse in, but as an immediate treatment I must admit, I went with the Sevin. The use of Sevin (5%) dust is sooooo controversial. 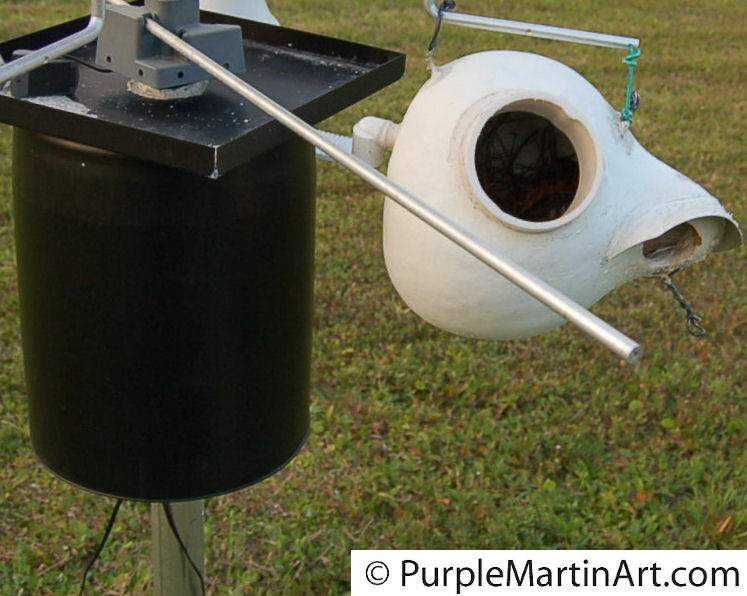 When it comes to purple martins there are many treatments that folks will swear by. 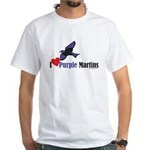 Follows is a list of treatments YOU can try to control parasites in your purple martins nests. Complete Nest Change: Probably the safest but takes the most time. I would not recommend doing more than 1 or 2 at any one nest check only because of the time involved and if there are eggs being incubated or young that need to be kept warm, it could deprive other nests of parental care. Nest replacements is the current “endorsed” way to treat parasite infestations of purple martin nests by the Purple Martin Conservation Association. Want to watch a nest change? Click here! Diatomaceous Earth (DE): The oldest remedy, DE has been used for ages as parasite control by purple martin landlords. Recently, DE has fallen somewhat out of favor for several reasons. It has been shown to cause severe lung issues if inhaled and when 4-6 purple martin nestlings are in an approx 10 inch nest flapping and exercising, lots of DE can get airborne and inhaled. Though not technically a pesticide, it has been shown to somewhat control parasites by ‘mechanical irritation’. Basically the ground up matter that forms DE rubs destroys a bugs outer skeleton to the point that the insect dries up and dies. Once wet, the DE is useless. I guess there are several ways to look at it. As a registered nurse I suppose I tend to look at things medically. You can either have the philosophy, to first do no harm. Or perhaps, it is case of the risks v.s benefits. 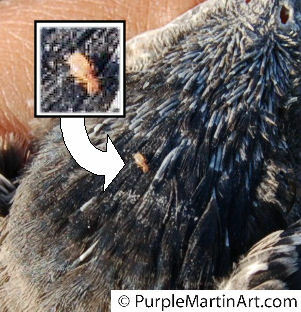 Let me know what crazy purple martin mite treatments you have heard of. A big thank you to those that emailed me about my recent snake attack. I should apologize to the snake that I vanquished to the City dump. Like I told Dave J, I know better than to kill the snake. It was a case of projection- at anger towards myself. So much for “Don’t hate the player, hate the game.” I doubt I will now start killing every snake I see. I usually catch them and then hold them for my 2 kids to touch and squeal over. Also in retrospect, should have known the snake must have gone partway up that pole before, as the last time I did a check there were none of the small tree frogs that like to sleep under the guard during the day. Regarding the inadequate S&K predator guard on one of the last remnants of S&K at my site; I sprayed foam insulation into the openings on the adaptor to close the passageway the snake must have used. I also placed snake netting below. In the pic you can see the gap that is formed when the circular opening of the guard is attached to the triangular pole adaptor that is underneath. Not only is their a gap there but then there are several small openings that are part of the design of the adaptor itself. The adaptor is actually the same piece that is used as one of the older S&K gourd racks. When in use as a gourd rack the rods that the gourds are hung on go through these openings. When used as an adaptor for the guards, there is nothing to block these openings and a small snake can pass through. As my experience has shown a small snake can easily kill just as effectively as a large snake. The spray foam insulation seems to have closed off these openings and be an easy fix. Also snake netting is in place anyway. A big thanks to Bob n Jo in Iowa, for letting me place a link to their FREE Purple Martin Bird House on my other website, purplemartins-r-us.com. It is a 7 page PDF plans to construct chalet style houses out of insulation foam board. If any of you complete this project, I would love to hear about it. While we as Purple Martin Landlords can try to provide the safest possible nesting environment for our birds, NO colony is immune from tragedy. Today was a case in point. As scheduled I performed a routine nest check. Since my children are inside my house napping. I usually break the nest check up. I do one rack then go inside and check on my kids, if all is quiet I go do the next. By around 4:30 this afternoon I was only able to do the 2 gourd racks. I could not get to the telescopic pole that has the house on it. Later, when my husband arrived, after dinner, I finally decided to go ahead and complete the nest check. I thought it would just be better to keep all 3 housing units on the same schedule. Well, thank God for that. Tragedy had struck! No other animal is more associated with the devil than snakes. Having been a snake owner at one time in my life, I can understand the fascination with them. They are eating machines. What other animal is so adept at finding, killing and consuming its prey, that it could fore go hands and feet? So at about 7:30PM, I was free to do the nest check. Usually I would never do a check so late in the evening. As a matter of fact, I always tell people that it is best to do the check when the least amount of birds are around. But today was different, I wanted to check on them and though light was fading fast, the light was good and the summer sun had another half hour yet to shine. I lowered the rack unaware of the horror that was about to greet me. As I lowered the quad-tel pole down, I could hear the hungry chirps of the babies in the Excluder gourd. The Excluder gourd and the natural gourd both hang under my aluminum purple martin house which is protected by a S&K plastic predator guard. A S&K platform feeder rests above the guard. Both nests are about the same age…about 6 days old. 5 babies in both nests. I was excited to see them, as I am with all my birds. I first checked on my “tame” purple Martin female in compartment “A” of the house. She sat against the wall and allowed me to take a picture of her with no fuss. A blessing to see her so quiet with her nestlings huddled under her. I spoke gentle and soft to let her know all was OK. Closing the compartment I checked the others on the house, saving the gourds for last. I opened the natural gourd access cap and lo and behold, the devil sat staring at me. 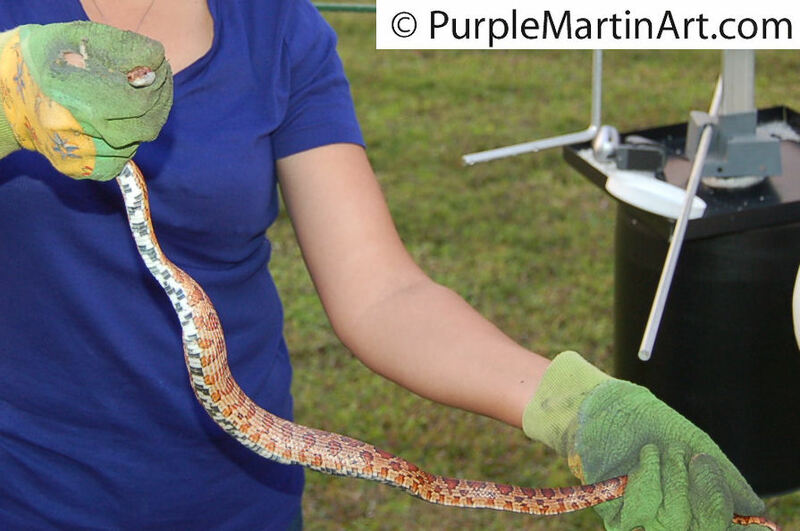 About 3 feet of red corn snake. One dead nestling underneath it and a few wing feathers from the mother martin were all that were left. I jumped back and cursed and so did the snake. Awakened from its comfortable spot of warmth with a full belly, it coiled back in the gourd. Thank goodness I keep my cell phone on me. My husband was out in a moment with my gardening gloves and I am not ashamed, I put the snake out of my misery. The poor dead nestling now alone in its nest. My son and I buried the nestling in the back corner of the yard. We said a prayer for it to find its way back to its mother and siblings, in Purple Martin heaven. The snake we left in the garbage can, for it to find its head. The take home #1. Use traditional stovepipe type aluminum pole guards with your round and square poles. In my opinion, the S&K pole guard is flawed when dealing with smaller snakes. Unfortunately the pole being triangular limits you on the type of pole guard you can use. But Small snakes can be just as damaging as a larger snake. 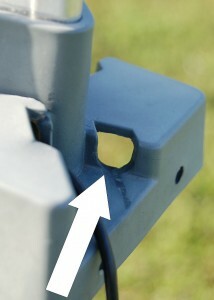 The plastic triangular hub that the guard attaches to, has small openings that this small snake with a 1/2 inch head was able to easily pass through. A traditional guard-installed properly, has no such gaps and would have protected from this little snake. Take home #2. Don’t let complacency keep you from installing snake netting. Though I have it handy and used it last year, I had not “gotten around to it” yet this year. Snake netting will be added tomorrow. The daily trials and tribulations of birds is always a fascination for me. I look at them and see the challenges they face and it always seems to put my life’s issues in perspective. For being birdbrained, as they say, they sure put up with major issues. Take the mockingbird pair, for example. The baby mocker is now fledged and the parents are now trying for clutch #2 in the same tangle of bushes in the neighbors yard. Far be it from me to suggest my roebelenii palms that they nested in last year. Even though I was a dedicated scarecrow, they just couldn’t handle the noise me and my brood produce. I was constantly telling my 2 boys to be quiet because the birds and that would just make them scream in naughty delight. Of course the purple martins could care less about the noise. The more noise we make, the safer from hawks they are. Well, the mockingbirds don’t agree. They prefer the quiet solace of an out of the way spot. Unfortunately, the nest has been made. An American Crow sniffed them out of their little spot. First I saw it land, cawing loudly on the wires across the street. It seemed to know the way, so I have a feeling it may have made this trip before. The mockers were frantic, of course. Dive bombing and calling out in alarm, the crow was not to be dissuaded from his target. Branch by branch it made its way closer to the bush. It landed atop the bush and started to weave its way down into the thicket that held the mockingbirds nest. The parent mockers continued the battle, to no avail. Eventually the crow sat, apparently in the nest itself and had its way with either eggs or nestlings. Of course I was outside running at this point. Jumping our fence, I knew how ridiculous this was. I mean, if the crow knows where the nest is there is no hope for it now. But it was painful to watch and to do something was the only option. The crow flew off and the mockers chased after it. I stood there about 10 feet from what once was a baby birds nursery and knew that now it was its grave. How sad. My husband came home to an earful of stories. Beyond the good news of the nest check there were several interesting observations at our colony here at PurpleMartins-R-Us HQ. Let me get the good news of the nest check out first. I am not sure if I will break the magical 100 mark but my birds are trying to comply with my wishes. What is the magical 100? Well, I don’t know if this applies to everyone. It may just be a perception in my mind of the number of fledged young that I am aiming to reach. It seems to me that 100 fledged young is the number that takes a small martin colony and turns it into something special. Super colony status? 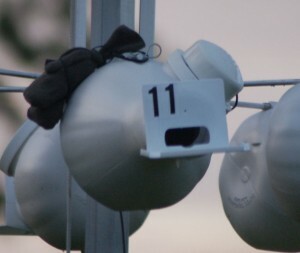 Probably not, but still…over 100 purple martin fledglings-to me- is a badge of honor. I look up to those landlords. Maybe because once you have reached that number your colony is faced with other problems that a smaller colony just does not have to deal with. The amount of time that a nest check takes, in itself is no small feat. Nevertheless, I am not sure that with the natural percentage of eggs to fledge I will make it. 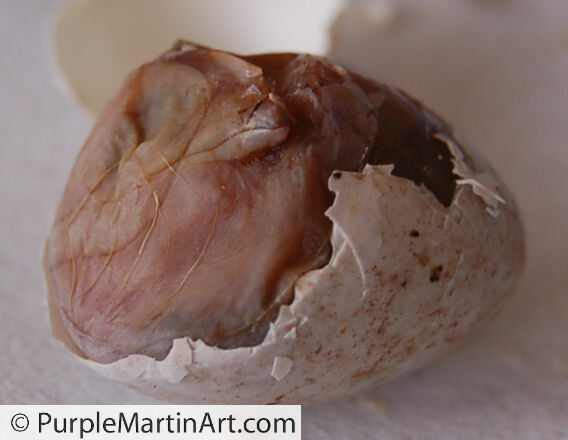 On average about 75% of purple martin eggs that are laid will hatch and survive till fledging age. So statistically, my chances are slim. On a hopeful note, I did have an above average success rate last year of about 88%. So on my way out to do the nest check, I see a Purple Martin flapping furiously at the entrance of “K” Gourd. ( I have 2 Economy 12 Gourd racks so to distinguish the gourds and decrease my own confusion-the gourds on one rack are numbered the others are lettered) I take a pic and go out to the rack. At each step I am thinking she will see how close I am approaching and like all the other martins, will fly up sounding her displeasure. She does not. Not only does she not fly off, she looks down at me and then sticks her head back in the gourd to continue biting whom ever. OK, so now I know there is a real fight going on. I know she is not entrapped in the SREH entrance. So what is up? I start talking to her. “OK now, cut that out!” Eventually as I begin to remove the predator pole guard, she releases her hold and flies off. Once I start lowing the house, even with me talking quite loudly, several other birds fly out from this gourd and that and I quickly forget about the tussle and focus on the check. After all, I am curious as to how the rack is doing as egg laying had seemed to stall before the few days of heavy rain we had late last week. I begin opening gourds and counting eggs and I hear a scratching noise. Uh oh, now what. I go over to gourd “K” and there is a beautiful SY male looking at me. Head out, body in..stuck. I open the access port to the Troyer gourd and reach in with one hand and gently push his head to try and determine how he is stuck. For such small birds it is really amazing how taut there little bodies are. One big flying muscular machine. As light weight as they are, purple martin are compact, lean and strong. But wait…if I am feeling his wings then how can his head be out of the gourd? He would have to have a 4 inch neck? Slowly it dawns on me. He is not alone. Apparently another SY male is trying to force himself out at the same time and has the one martin pushed up and unable to get out. Apparently the female was trying to get this fellow out while the females mate was punishing him from the rear. A small amount of smeared blood on the inside portion of the gourd but all eyes are intact and no obvious injuries. Just his own wounded pride. I work them free and look them over. Overjoyed that I can hold these magnificent birds in my hands and grateful that I was there to break up the fight before any real damage occurred. I open one hand…then the next and they rise up to greet the sky. Crazy kids! In an upcoming blog entry I will talk about issues one can have with SY males and the problems they can create. And I didn’t even mention the hawk we saw! I will save that for tomorrow! Even though the temps hover in the mid 80′s it is still breezy enough to enjoy an afternoon walk down the street. The boys are forever curious about the birds, nature and all sentences that can begin and end with the word, “Why?” So it was that we took one of our walks. The first destination was to the canal at the end of the street where they still remember the dead alligator that was left there some months back. How it got there, I have no idea but the team of Turkey Vultures that were taking turns crawling up inside the dead beast were educational to say the least. Some might say that the sight was too gruesome to show a then 2 1/2 and 4 year old…they may or may not be right. All I know is that they have not had any nightmares over it. So there we were at the spot that once was the resting spot for the dead gator. There is nothing left of the gator. Only Muscovy feathers litter the ground. As we walked away I could see the Purple Martins visiting a neighbors pond. That was our next destination. As I found an ant-free spot to sit, the boys occupied themselves with the all important task of throwing grass in the pond. The martins were taking turns dipping down for a drink and didn’t mind us at all. One by one they take a drink then fly off to the South East. Then another few would come from our yard and repeat the process. The boys were oblivious to the martins slaking their thirst but perhaps on a subliminal level they took note and asked for their cups (which of course I always have) We sat on the banks of the pond and looked out at the pond in a rare and silent moment. They drinking in their water. Me, drinking in my martins. Yesterdays nest check was postponed. At 3pm the skies were dark and a drizzle was falling. By 4:30 pm or so a steady rain was falling and distant thunder was heard. By 5 pm a deluge of water let loose. It was fantastic. In the midst of the biggest drought on record for some 80 years, South Florida needs whatever rain mother nature can muster. The landscaping is hopelessly lost. The grass is overrun with the hardier weeds and my suspect to the sparse egg laying on the last nest check is dry weather. It is a well known fact that birds have biological cues that trigger nesting bahavior. Daylight is probably the best known cue but another highly important ingredient is the abundance of food. In breeding Finches (another hobby of mine) Daylight can be measured in exact quantities by using a timer. But without the proper dietary considerations the birds will not start nesting. It is the same for all birds. As barometers of the environment, birds can show stress even when us humans are oblivious to the subtle signs that drive their inner workings. So as the first gourd rack filled up in record time, the later arriving birds are now all competing for the same dry season level of insects. Nature makes the spring a wet season for a reason. It all is timed perfectly so that the spring showers can produce a cascading chain of life. More water = more life= even more life. With a drought the spring season begins but stalls out and the heavy spring influx of birds is left with a dry dinner plate as well. This morning the birds are obviously ecstatic about the rain that continued to fall throughout the night. I hope to do a nest check today that will give a great baseline to see if more eggs appear in the coming week or so. 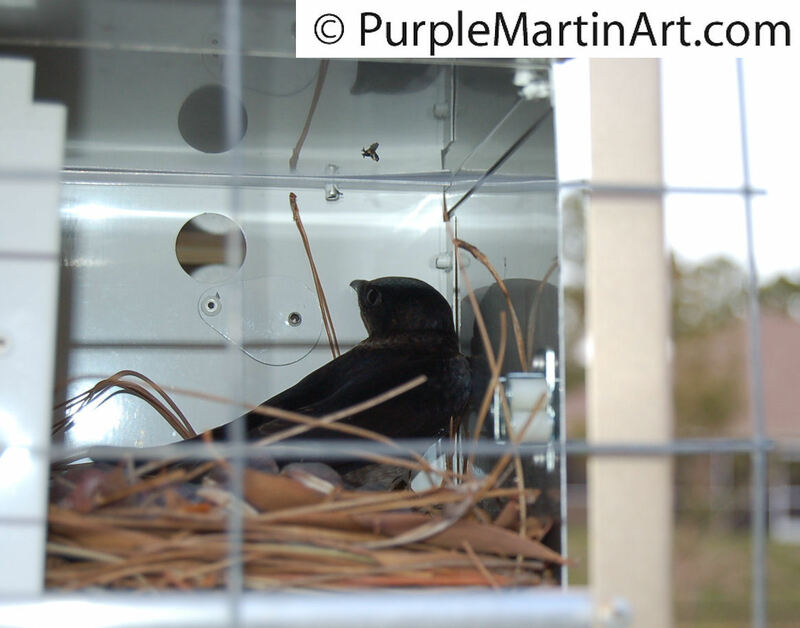 In other news more photos have been uploaded to the gallery, another art piece is in the works and PurpleMartins-R-Us.com, our webstore continues to grow as a source of Purple Martin information and purple martin houses and supplies. If you have not had a chance to visit, please do. When I received an email from Tim M. regarding the large rat looking object on gourd #11, I had to admit it looked odd. For the people who look in on my colony, to see the large black ‘thing’ clinging to the side of the gourd, I apologize if I frightened any of you. It does look like a rat hanging on the side but alas it is just a few socks with rocks inside. The added weight of the web camera housing had the gourd leaning over to the side. Not that the Purple Martins minded this at all. BUT the eggs and now nestlings, kept settling just below camera view. Every time I did a nest check I had to move the nest over so that the nestcamcaught a better view of the action. I had tried multiple times to adjust the camera, to no avail. Finally, at my wits end, I zip tied the rocks as a counter weight the gourd. With one egg left in the gourd I hope to catch a better view of the babies now that they are being fed. I am not sure about the remaining egg on the nestcam. Whether or not it will eventually hatch. I had counted 4 eggs multiple times on previous nest checks. And though it is probably a case of me missing the 5th egg (several times) it could also be an egg that it was dumped by another female. Well, it could happen. Though eggs can hatch up to 48 hours apart, the window is closing fast and if the egg has not hatched by the morning, I am afraid its chances are slim. Mom and dad are busy feeding the 4 nestlings, so incubation of the final egg is dwindling. After the pipping egg death, I am hesitant to handle the egg. If it is still unhatched in another day I will look at it closer. The male ASY martin is being very enthusiastic about feeding his nestlings. I watched him bring in a small dragonfly that appeared way to large for the little nestling and try for some time to stuff it down one of the babies. The little nestling had wings sticking out of his mouth and I watched as he was apparently trying to pull the wings off of it. It was comical but this sort of thing can be dangerous. The numbered gourd rack (the birdcam) is now officially 100% occupied with eggs and/or young. Another nest check will be done Sunday afternoon. I was just outside letting my dog out for his last foray of the night. The air is perfectly comfortable and a perfect South Florida night. The neighborhood Chucks Will-widow is calling out in its haunting and beautiful call. My son who was up all night with a 103 fever seems back on the mend. All is right with the world. Friday I will be doing a nest check. Looking at my watch I see it IS Friday so this is not much of a heads up. 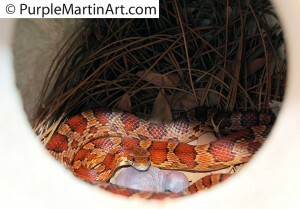 Since several nests are due to hatch, I will probably do another check come Sunday. (Just for fun!) Sometime between 3pm and 5pm EST, the usual time. Of course, you can watch me on the Birdcam and laugh at me, if you like. Also, the nestcam has one egg hatched so far and 4 more eggs at any moment. Their are several starlings that are regularly feeding in my yard every morning. I have made feeble attempts with my pellet gun, to no avail. My aim is ridiculously bad and every time I squeeze off a shot, I blush with shame. Both from my bad aim and the picture I make, out in the yard in my bathrobe, morning hair and a pellet gun. The neighbors at least have free entertainment. I even have put out my home made wire bait trap which I used last season as a holding cage for the starlings. It is even more poorly made than my repeating nest trap. The starlings have no interest however in the popcorn and cereal I have placed inside. I will persist though. Should I ever manage to catch something with the trap, my husband owes me a sushi dinner. Yesterday evening I saw a lone starling perched on the phone line stalking my colony. Fortunately I am using SREH (starling resistant entrance holes) so my birds are safe, for the most part. On another bird note. The mocking bird fledgling is almost indistinguishable from its parents. It follows its parents in the yard. Silently doing their wing displays as they scurry from spot to spot on the lawn. I only see the one fledgling which speaks volumes on the survival rate of these brush nesting birds. The neighbors which have at least 2 cats are constantly on the prowl. My dog has chased them out of my yard and away from the purple martin poles on numerous occasions. I am not sure how I will address the issue come fledge time but if I have to chase cats, I will. Another reason to call me a crazy bird lady. All I need now is a little more gray hair. Today brought some much needed rain and another nest check. The South Florida drought is again becoming more threatening, but today’s passing showers brought a brief respite. The birds enjoyed the morning shower, though brief, with zealous preening and a social hour. The skies cleared for the early afternoon only to darken again around 5pm and then finally open up for another soaking before dusk. The skies remained solemn as darkness fell and the birds retired quietly for the night. The nest check started around 4:30 on the gourd rack and house that is off camera. My 2 young children were taking a nap (YEAH!) and I was in checking on them frequently. I finally got to the gourd rack on the webcam right around 5 and the wind was starting to gust. As I now have 31 compartments, I will post total numbers unless something of interest needs to be posted. The two nests in the aluminum house have 6 eggs and 5 eggs, Numbered rack has only one troyer with no eggs. I added 2 more Troyers to the Lettered gourd rack and all the other gourds seem to be occupied but the egg laying has slowed to a crawl. Of the 10 gourds on this rack only 2 have eggs and only 1 egg in one and 2 in the other. I wonder if the dry weather is a form of natural birth control for the martins? The pipping egg, that I had posted about recently had been in gourd #3. Among the first of this years babies to hatch, these nestlings are between 5 and 6 days old. I counted and there were only 4 of them. I was excited to meet the little nestling that would be some 2 days younger than his nest mates. I was curious to see how he would be fairing as the ‘runt of the litter’. I lifted a few of the fat little bodies out of the way and found the egg buried underneath them. The same as I had left it, with the hopeful hole pecked perfectly in the center of the egg. A small beak just below…only dead. Oh how sad. How close this baby had been to the world. What could have happened? I am guilt stricken. This brings up an important point about pipping eggs that some may not be aware of. There are 3 things that can cause a pipped egg to die without hatching. When an egg is pipping the amount of humidity or moisture in the air is critical. Being a wild bird, the humidity level in the nest is not something that we can monitor or adjust for. The birds know what they are doing. Some people have said that perhaps that is why green leaves are brought into the nest. It is one of those things that God endows his creatures with an inner knowledge that man, in all our sophistication, may never truly understand. When it comes to poultry, it is commonly understood that slightly too high humidity can drown a nestling. And humidity just a tad too low can cause the membranes to stick around the nose and basically suffocate the nestling. The third and last cause, improper or poor air flow/circulation may well have been the likely culprit in this case. Nestlings can pip fast or slow and they do it in their own time. When it comes to poultry a chick can take an hour or a day…it’s really up to the bird. So the fact that I did not see movement was not a concern but, It may well have been dead when I found it initially. We also have to consider that the other nestlings were being fed. The nestlings at 2 days old were already more than twice the size of the egg. They were mobile and wiggling around the nest to some extent. Raising their heads and instinctively positioning themselves in the nest. All it would have taken is one of the nestlings to rest its head over the small hole or for the moving babies to cause the egg to roll over enough to suffocate the nestling inside. I took care when putting the egg back in the nest to position it as I had found it…pip up and small side down. But I should have looked at the egg more carefully, to in fact confirm movement. I should not have assumed that the nestling was alive and well. Maybe in placing it back in the nest after picking up and replacing nest mates, that its ideal spot was disturbed and it was then more likely to roll to the side-sealing its fate? I will never know. Fortunately the 4 other nestlings are fat and oblivious to their brother (or sisters) demise. It’s a hard life-a birds life. Maybe that is why we work so hard to make the little parts we can easier for our martins. As you can see by the post mortem photo, that the nestling appears asleep and peaceful. Its little beak was through the inner membranes. Speaking of hatching. The eggs in gourd #11 are due to hatch as of Wednesday April 15. So keep an eye out for more pipping and cross your fingers! Watch them on ournestcam, of course. Other good news is the gourd on the Shepard’s hook now has 5 eggs. I wonder how those babies will feel about me mowing the grass and peeking in as I drive by?